Welcome to this terrific neighborhood to be enjoyed by all! Bright & open floor plan w/gleaming hardwood throughout main level & neutral throughout; 2-story entry foyer! Living room flows into dining room with access to kitchen. Appliances ('13) stay with kitchen that features a work space plus snack bar and breakfast area opening to fenced backyard. Great space to entertain! Upper level includes the master suite with full, newly updated bath plus additional full bath in hall. Lots of storage space. Lower level provides additional entertainment space with bar area, surround sound and even more storage space! Oversized patio with brick pavers and hot tub for your enjoyment. Green space available for pets & yard games. All located in cul-de-sac w/access to community pool & clubhouse. New in '18 sump pump, water heater; '12 roof; HVAC contracted with preventive service agreement. 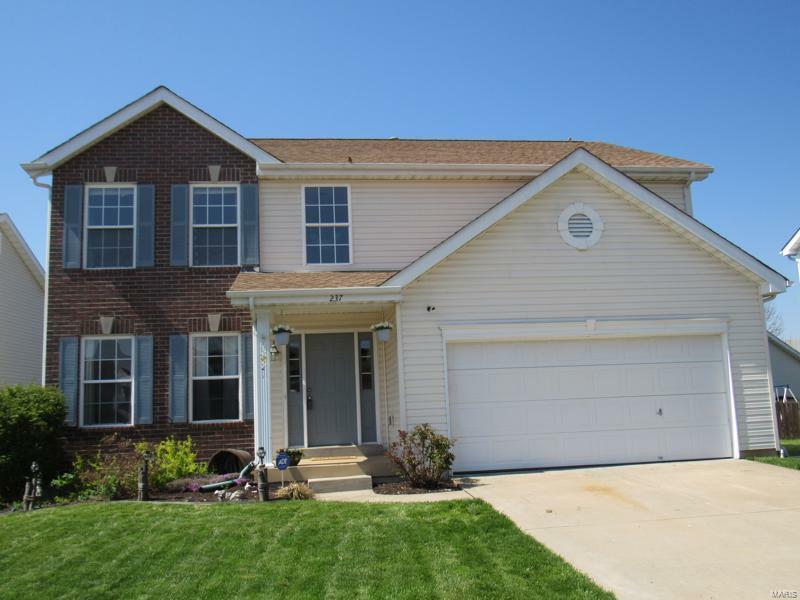 Conveniently located near bike trail, Metrolink, schools & Scott AFB. Occupancy completed and move in ready!